What is the difference between a genetically "Plain or Classic" boxer, a white boxer, and a "Flashy" boxer? 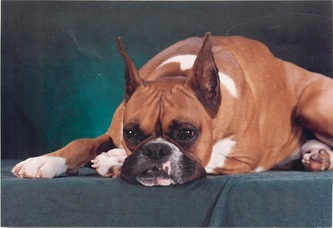 Typically a plain/classic boxer is identified as one with little to no white on the face, no white above the toes and only a small amount of white on the chest. However, the marking pattern is affected by modifiers, so that a flashy Boxer, while genetically the same as another flashy Boxer, will not be phenotypically the same - one may have a full white collar, the other may only have white "stockings" and no white on the neck. Also, genetically plain Boxers do have a minimal amount of white markings on the toes, chest and belly. 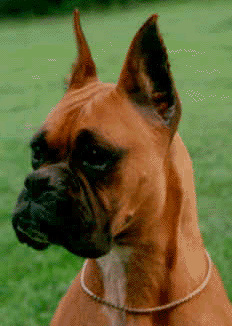 Because of the modifiers, a genetically flashy Boxer that is modified to have only a small amount of white markings may look phenotypically identical to a genetically plain Boxer. The only way to know for sure is to breed the dog understanding fully the genetic inheritance of white markings. 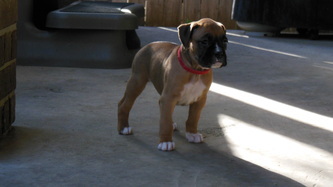 A genetically plain/classic boxer bred to a genetically flashy boxer will not throw any white puppies. Brindle is a dominant color in boxers. Fawn is a recessive color. This means that if you breed fawn to fawn, you get 100% fawn puppies. If you breed Brindle, you need to know the genotype of that dog - does he/she have a fawn allele to contribute to a breeding? If the Brindle dog has a fawn parent, the answer is automatically YES. If the Brindle dog has a Brindle parent, you need to breed them to a fawn dog to find out what their genotype is. There is no gene test for coat color at this time.